You probably saw the headlines last week, read the social media postings or heard through the grapevine that Chief Gordon Ramsay has been hired as the new police chief in Wichita, KS. He has also been both to the MCPA. Over ten years ago, Gordon joined the association as a sergeant. He told me he hoped back then that the membership would help him become an effective leader. He would quickly move up the ranks in his agency and in the association, serving as a Director, a co-chair of our Legislative Committee and ultimately our President. I’ve only been here 18 months, but it’s clear that Gordon’s knowledge, know-how and leadership played a big role in advancing this association to new levels in several areas. Perhaps I’m biased because he took a chance on a “non-traditional” candidate and hired me as the Executive Director. But I believe I’m being objective when I say that Wichita is fortunate to have him. 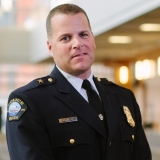 The city of Duluth and the Minnesota Chiefs of Police Association will miss you.